Typical. A couple of months ago in my Beach Buggy Racing review I complained about the lack of kart racing games on current-gen systems. And now here’s a second one. 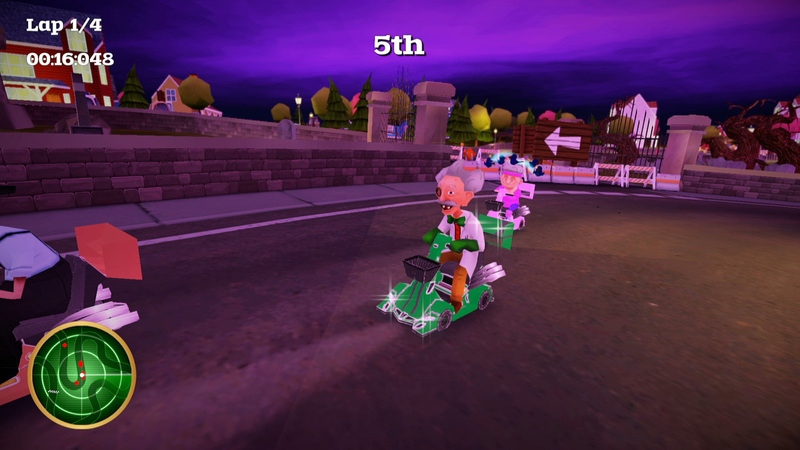 What I should have moaned about was the lack of great kart racers, because it’s safe to say Coffin Dodgers doesn’t exactly scratch that itch. To its credit, its premise is funny. A group of seven pensioners living out their twilight years in a retirement home are confronted by the Grim Reaper, who tells them their time will be up in a few days. Deciding they quite fancy sticking around, the seven come up with a plot and challenge Death to a racing tournament. If he wins he can claim their souls, otherwise he can piss off and leave them to their dominoes. This forms the basis for the Story mode, which consists of four cups each containing three races. Each cup has a specific design – town, city, farm and graveyard – and your typical Mario Kart points system determines who’s on top after each trio of races. Here’s the twist: at the end of each cup, the bottom two racers are killed by the Grim Reaper and return as zombies for the remaining cups. 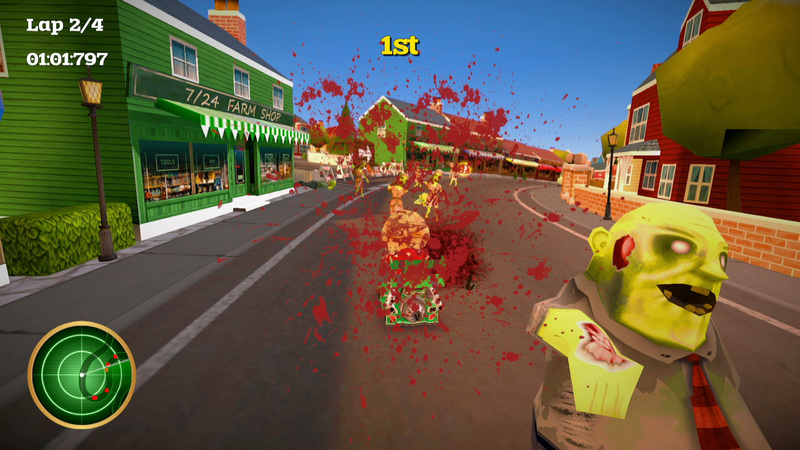 It’s a clever idea, even though the zombies seemingly don’t race any differently. 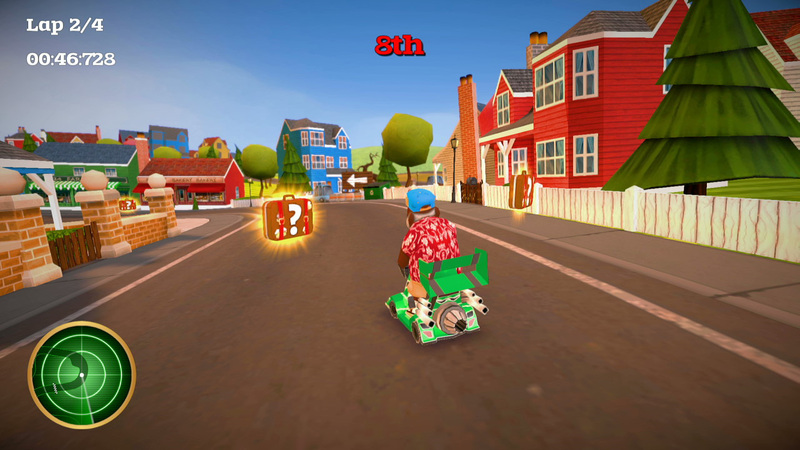 Each win in Story mode gives you cash you can use to upgrade your kart. Well, mobility scooter. You know what I mean. It’s your standard upgrade fare: speed, acceleration, all that nonsense. It serves a purpose but is pretty generic stuff. Oddly, you also gain XP for every action you perform during the race, such as attacking your enemies. I say ‘oddly’ because for some reason this XP doesn’t actually seem to do anything. There’s no mechanism for levelling up your character, and all your kart upgrades are handled with in-game currency, so the presence of XP points is a complete mystery. This is the first sign Coffin Dodgers might feel a little unfinished, and it’s a concern that continues throughout. For example, the Story mode is tragically short: its 13 tracks can be finished in under an hour. There’s no real incentive to play the Story mode ever again after this, other than an achievement/trophy for beating it a second time as the newly-unlocked Grim Reaper to get an alternative ending (one that teases a potentially offensive sequel, I should add). Replay value could have been improved if the playable characters were entertaining but they’re just too bland to have you even dream of getting attached to them. The character design is passable and when you look at each of their bio screens there’s a clear sense of humour lying somewhere under its wrinkles. 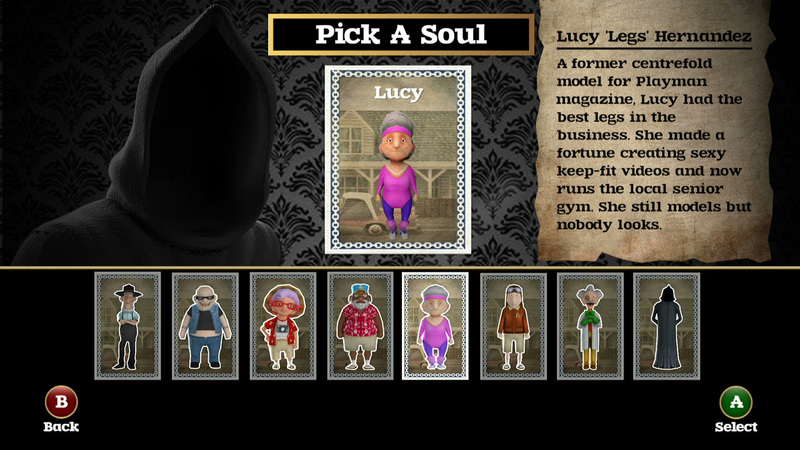 The token ‘hot female’ character is an elderly lady who used to be a centrefold model but now runs the local seniors gym – “she still models but nobody looks”, we’re cruelly told. 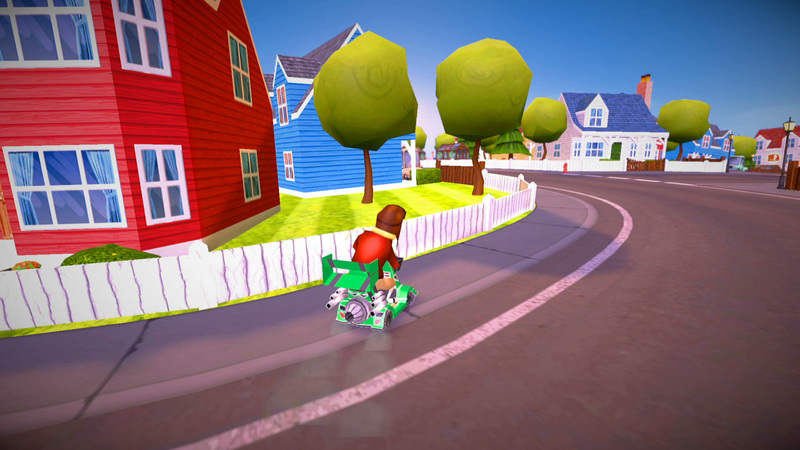 But the range of personalities described in these bios never really manage to carry over to the actual gameplay – instead you’re left with a series of generic racers who don’t even feel notably different from each other when you’re playing as them. In fairness, there are a couple of nice visual touches where it’s clear there’s been some attempt at giving each pensioner some character. Use a speed boost with former Harley Davidson biker Hank and the force will push his sunglasses over the top of his head, causing him to gingerly slide them back down when he drops to normal speed. These little nuggets of charm are few and far between though, and ultimately for the most part both the characters and environments look more like a Dreamcast game that’s been enhanced through an emulator. Sadly, as basic as it looks in screenshots, in motion even more flaws are evident, particularly the frame rate. To be clear, I’m not one of those “give me 60fps or I’m not playing it” snobs. I’m perfectly happy with a steady frame rate of 30fps if need be. But the key word there is ‘steady’. For a game that looks this basic, there’s absolutely no excuse for its frame rate to be so erratic. It constantly feels like the game is struggling to cope, which can be nothing more than the result of poor optimisation. As you can see, it’s just horribly janky. 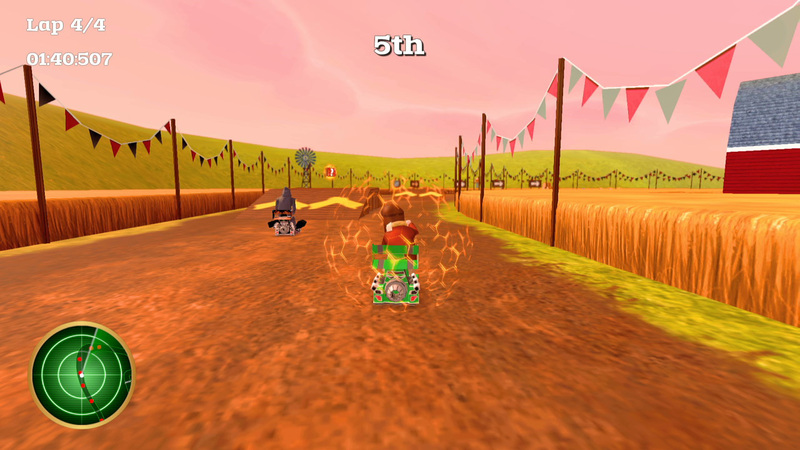 It’s constantly slowing down and speeding up as if your kart is oddly pulsing along the track, and while in some games an unstable frame rate can be tolerable, here it’s really distracting. 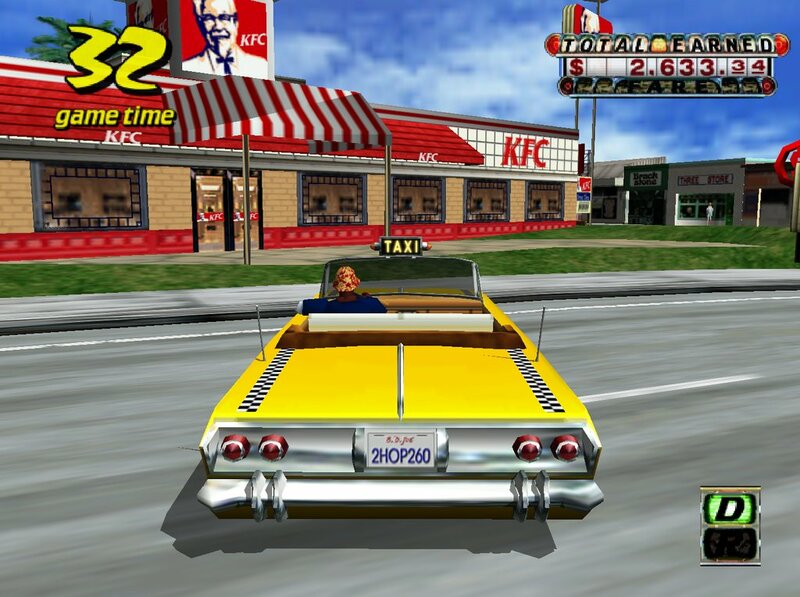 Other than the Story mode and the bog-standard Quick Race, Time Trial and Multiplayer options that come as standard in most racing games, the only other unique offerings are a pointless free-roaming mode (where you just drive around an empty track) and something called Crazy Granddad. 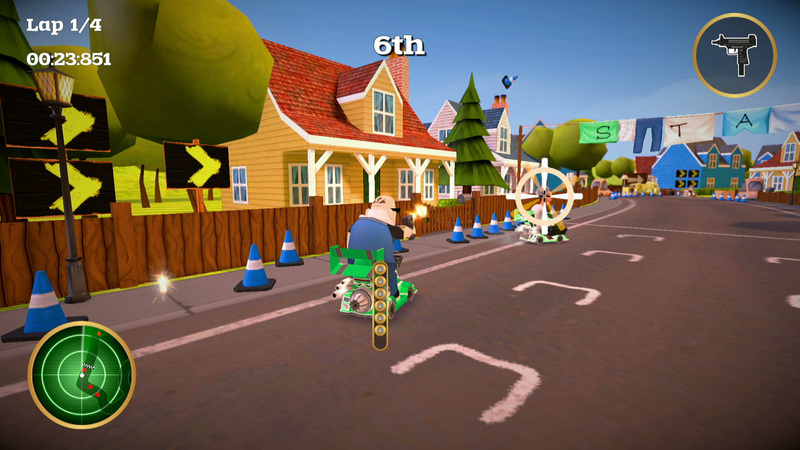 As you may suspect, this is an homage to Crazy Taxi, in which you have to drive around the level collecting packages which top up your timer. Like everything else in the game though, while it may have some potential it’s just severely undercooked. That’s essentially the overriding feeling when playing Coffin Dodgers: it’s undercooked. From the lack of character variation to the pointless XP system to the unstable visuals, from top to bottom it feels like a game that could have done with another few months’ work on it. Ultimately, at a little under £10 the whole thing is far too expensive for what it offers. The Story mode is done before your arse gets a chance to warm the couch, you can get your full 1000 Gamescore (or your Platinum trophy) in under two hours, and you’re unlikely to keep coming back to it for more than that. 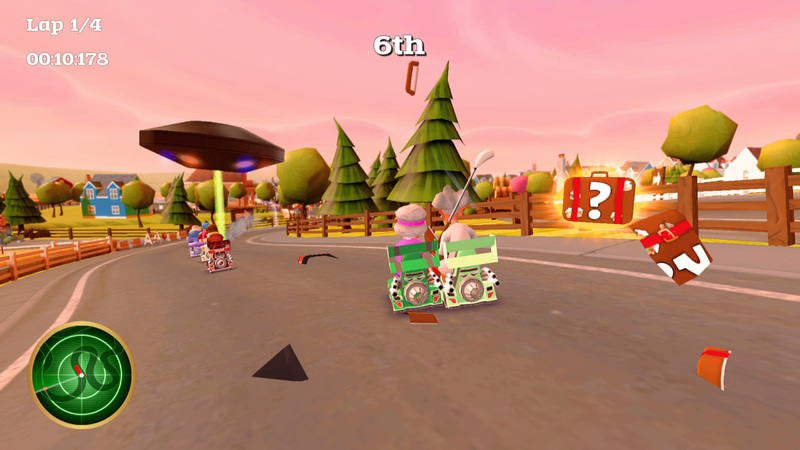 If you really need a kart game on your console, Beach Buggy Racing is currently the best of a bad bunch. There still isn’t a truly great current-gen karting offering, but you really should resist the temptation to make do with this one. I suppose you could say, ahem, that it gets old fast. Coffin Dodgers is available for download now on Xbox One, PS4 and Steam. In order that I could write this review, I received a free code for the game from the developer. The content of my review and the opinions therein were in no way positively influenced by this. Because let’s face it: if they were, I’m probably doing it wrong. If you enjoyed this review and want to help me write them more frequently, consider donating to my Patreon account.